I learnt how to speed read when I was really young, and most times it has stood me in good stead when looking for a particular term or phrase in a sheaf of papers. But last week, my speed reading did not work out as planned. We got back from overseas on the 6th and I only came into the office on the 8th as the Wednesday was a public holiday for us so we could go and vote. I glanced at this month’s Daring Cooks’ challenge and saw we were tasked to make Maftoul, which I know as Israeli cous cous. I saw the words “Otam Ottolenghi” and “Jerusalem” and made the assumption that the recipe was in this book. I have only read brilliant things about the recipe book and I decided I would get myself a copy and use his recipe for the challenge. When I got to the book shop the following day, a young gentleman came to assist me and found the book for me. I gulped a bit at the price (R549) and as it was sealed I could not even look at the book. The shop assistant opened the book for me – they can do this and reseal the books! And lo and behold, the book only mentions maftoul and does not have a recipe for it. I decided to not buy the book, or even try and make the maftoul as by now I had run out of time. I will add this on to my list of challenges to complete, but despite not having done the first part of the challenge, I did do the second, which was to create a recipe. I made a cous cous salad with ingredients inspired by the tastes of the Middle East, and to go with it I made a lime and coriander dressing which is sublime! Blog-checking lines: The May Daring Cooks’ Challenge was hosted by the incomparable Sawsan from chef in disguise. Sawsan challenged us to try our hands (literally!) at making maftoul – hand-rolled Palestinian couscous that is as versatile as it is tasty! A lovely combo of fine ingredients! A while ago, I made a similar dressing but used coriander, orange juice, soy yoghurt & avocado together in a dressing & it was so delicious too so I know that your dresssing will be divine!! I would serve simple fresh grilled fish on the side here! This dressing is all kinds of heaven for me. I simply must make it. I love that salad dressing! I need to give it a try soon. Coriander dressing sounds so bright – yum! I think I am going to have to add the book to my wish list! I really need to make my own salad dressings more. You’ve certainly inspired me with this salad! I love how colourful the beautiful Mediterranean salad is! Delicious and I also a big fan of the dressing! Such a colorful Mediterranean dish perfect for a health buff like me! This is a beautiful photo, Tandy! Pics like this make food look sooo appetizing even before it touches your lips. My daughters and I LOVE couscous salads. This one looks gorgeous and fresh and delicious. Will definitely give this one a try Tandy. It looks gorgeous Tandy. Shame you didn’t get a copy of the book in the UK, it is full of so many amazing recipes, I can’t recommend it highly enough! Coriander is one of my favorites and I enjoy finding new ways to prepare it so thank you! Hi Tandy, what a great recipe, love couscous and your dressing sounds divine. The daring cook’s challenge sounds like a fun group to be in. This salad sounds so refreshing! i love that dressing! Love the dressing, I can easily imagine how great it tastes! Couscous is really one of my summer favourites, I will happily copy yours and add some pomegranate arils next time. Thanks for the wonderful tips! That dressing sounds amazing, Tandy. I need to pick up some yoghurt today. 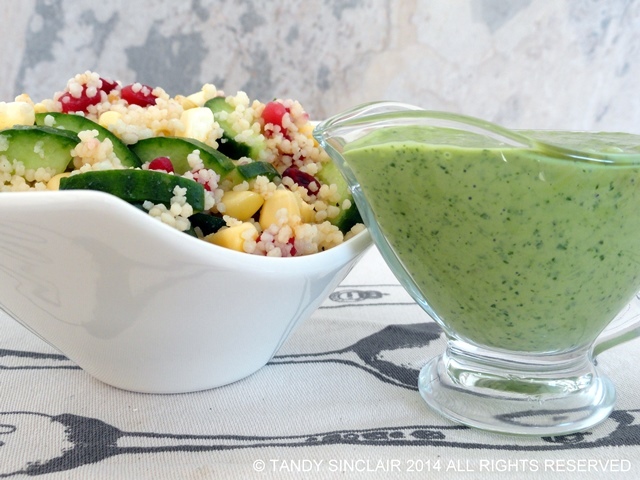 Scrumptious salad Tandy – love your dressing – that would definitely be a huge hit with me.